FCI Watchman Answer Key 2017: Dear Readers Food Corporation of India recently recruit 1233 Watchman posts in various region. This exam is successfully held on 17th December of 2017 in Rajasthan at various examination centers, after the examination students also find to check their score on getting in FCI Watchman Exam 2017. RpscGuru team also working to find Answer Key for the FCI Watchman 2017. 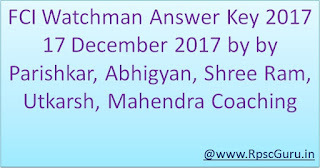 Parishar FCI Watchman Answer Key: After conduction of each examinations in Rajasthan Parishkar coaching Institute has also published to every examination answer key. We are try to provide FCI Watchman Answer and cut off marks required for select in next stage, so we are suggested to stay connect with us for all latest update about FCI Watchman Recruitment 2017. FCI Watchman Exam 2017 the written test will be held as on 17th December 2017 and this exam comprised of 120 Multiple Choice Questions of General Knowledge, Aptitude consisting of Reasoning, English Language, General Awareness, Current Events and Numerical Ability. All questions carry equal 1 mark. There will be no negative marking. The Question Papers will be bilingual i.e. in English and Hindi language. 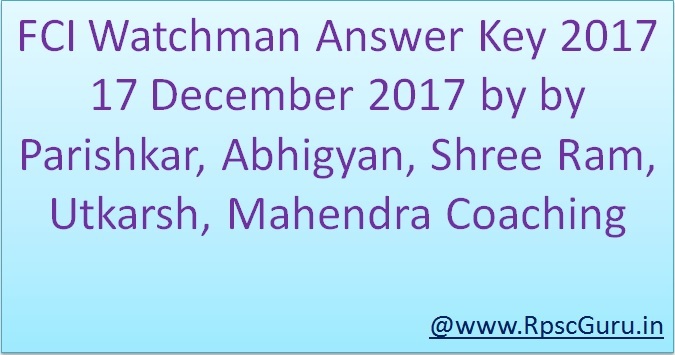 FCI Exam Answer Key: Readers keep following this article for download FCI Watchman answer key for 17th December 2017 and reacquired essential cut off marks for Physical test.